Unfortunately, drunk driving is far too common in the US. There at least 1.4 million arrests made annually. And those are only the ones that get caught. Even worse, drunk driving is responsible for 30 percent of traffic related fatalities that occur every year. Drunk driving accidents often result in catastrophic injuries when a drunk driver collides with another vehicle. The consequences are even worse when the crash involves a pedestrian and a motor vehicle. Many pedestrian victims don’t make it out of the accident alive. Those who do survive the accident often have to endure serious injuries resulting from the accident for the rest of their lives. Pedestrian accidents caused by intoxicated drivers are more complex than other car accident claims. For one thing, drunk driving accidents raise both civil and criminal issues. When an intoxicated driver causes an accident, they usually will be arrested. The intoxicated driver will be subject to criminal charges for driving while under the influence of alcohol or drugs. These criminal charges are separate from any civil lawsuit brought by the victim seeking compensation for his injuries. Victims of accidents caused by intoxicated drivers are not entitled to any part of the criminal fine that the intoxicated driver may be ordered by the court to pay for their actions. 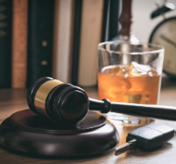 If you were injured in an accident caused by an intoxicated driver, you will have to file a claim for compensation if you want the compensation. Your claim will be a lawsuit that you must file in a civil court. The compensation awarded will be based on your pain and suffering, medical bills, lost wages, and other expenses experienced as a result of the accident. Many pedestrian accident victims are able to get compensation for the injuries and financial losses by suing the intoxicated driver who caused them. Of course, compensation is dependent on the driver having auto insurance or being financially able to pay the settlement or award. When a pedestrian dies as a result of injuries suffered due to a drunk driver, the family or representative of the victim’s estate can seek compensation by suing the driver for wrongful death. Again, any compensation or recovery may be dependent on insurance coverage or the defendant’s personal net worth. The amount received by the victim as compensation will vary depending on a number of factors including the extent of their injuries. It is always wise to hire an experienced lawyer as soon as possible after the accident. Your attorney will investigate the accident and advise you on what your case is worth. Your attorney will also help you file your claim and represent you throughout the process of seeking compensation.